There is a comprehensive and very thought-provoking article on "smart" cognitive "enhancer" drugs like Ritalin and modafinil in Mosaic Magazine that's well worth your time. The very fact that I am putting "smart" and "enhancer" in quotes tells you where the article's coming from. The problem with these pills is that their lure is seductive, so more often than not we would all like to overstate their promise. It's thus particularly important to take a realistic view of what they can and cannot do. 1. Nobody really knows how smart drugs work, except for a very limited understanding of substances like caffeine and a few brain pathways like those dealing with nicotinic acetylcholine receptors (in fact, nicotine and nicotine-like substances may well be the only true cognitive enhancers). This fact would be consistent with our general lack of understanding regarding neurological drugs. 2. Most important take-home message: These drugs don't really seem to "enhance" function; rather, they simply optimize existing function. An immediate corollary of this fact is that the drugs would show the greatest effect only in cognitively impoverished brains. Thus, the effect may be marginal to zero in normal people. Studies seem to support this contention. 3. There is an ongoing controversy about whether intense focus brought about by these drugs can stifle creativity. Opinion among neuroscientists seems to be divided, although I find myself leaning toward the pessimistic side. 4. As the article notes, studies seem to support this pessimistic view for now. Smart drugs don't really cause enhancement across the board; rather, they seem to modify performance on very narrowly defined tasks, especially related to attention and memory. 5. Another important take-home message: It's possible that smart drugs actually don't enhance cognitive function all. Instead what they might simply be doing is lowering other barriers necessary for normal cognitive function. Thus, instead of actually enhancing your ability to learn something for instance, they might simply be getting rid of the lethargy, procrastination and boredom that often keeps us from learning or picking up a book in the first place. This to me sounds logical. A good control experiment to run in this case would be a side-by-side comparison of a purported smart drug with another one that's known to only improve peripheral qualities such as alertness or mood. 6. There is legitimate concern that even if these drugs enhance certain functions, they may be affecting other functions in negative ways. More generally, there is legitimate concern that we simply don't know enough about the brain to understand what the side effects of these drugs on other parts of brain function might be. 7. Big Pharma is shying away from smart drug research partly because we don't understand how they work. Of course, the cynic in me says that we can still get away with marketing the hell out of marginally effective supplements like 5-Hour-Energy, but that's a topic for a different post. 8. The societal implications of smart drugs are fascinating and important. If their significant impact is only on cognitively deprived members of society, then we should legitimately ask whether they should be prescribed more to say, poor or homeless people whose "attention reserves" have been unfortunately spent on more pressing basic issues like health or housing. These are the folks who in theory might benefit the most from such medication. Of course, we would then also have to deal with the potential ethical implications of testing these drugs on such people. 9. Bottom line: There will be a market for certain smart drugs in the future. But these drugs will very likely be highly targeted, optimizing only limited functions like short attention spans or rote memorization. Enhancing memory or attention in a consistent manner might be an achievable goal in the short-term future, but enhancing creativity or general IQ might well be impossible. The prospect of a pill that enhances cognitive capabilities across the board might likely remain the stuff of movies like 'Limitless' (which is quite an entertaining movie, by the way). Clearly Ash wasn't taking Ritalin while writing this post, there are two #8. Joking aside I agree with your post. The science isn't fully developed, and if there's one organ we don't understand well it's the brain. At this time we can therefore only make logical assumptions about trends we see and extrapolate from there. There have been a few studies (postmortem) of brains of extremely smart people, and there is also research into currently alive savants. It's not a large jump to assume that the increase in connections in savant brains gifts them with improved memory and calculation and understanding. It's akin to upgrading a computer processor and then being able to run a program faster. Comparing insect brains to mammal brains to human brains shows a similar trend. It is also easy to observe and compare the difference in behavior of average people and savants, and guesstimate that the improved cognitive abilities of savants were counteracted by reduced interpersonal abilities. I also remember reading about how the increase in autism is correlated with the increase in data that we are barraged with everyday, with some people even suggesting this is brain evolution to deal with the increase in data. Stepping beyond what we currently know and thinking about the future and science fiction, including Limitless and the more recent variant Lucy (still in theaters), it is theoretically possible to increase the number of connections the brain makes. Both movies rely on this as their basic premise, that humans synthesize a drug that gives improved cognitive performance. In Limitless Cooper's character takes pills regularly to get temporary boosts (maybe 5-10% improved brain performance), but finds that mixing alcohol leads to horrible blackouts. That's a reasonable side effect given what we know about alcohols effects in the brain and on general motor and cognitive performance. If you tried to overclock a processor and pour water on it at the same time, the effects would be disastrous. Cooper further figures out that over time he can permanently alter his brain's organization and wean himself off of the drugs while still maintaining the improved level of performance. Contrast this to the plot in Lucy, where the drug has typical 'high' effects at low doses, but at overdose levels begins to give Johansson's character increase performance and abilities. It doesn't address the permanence of the effect, since the movie timeline is only a few days and the side effect is that Lucy's cells will autophagia and she would die. The abilities range from improved perception, the trailer shows her viewing EM waves and mentions dolphins with their echolocation, to complete physical control, instantly changing her hair color and even physical control over other people. * Over the course of the movie Lucy takes more and more of the drug, unlocking more and more of her brain power, until the climactic end scene where she tries to reach that upper limit, 100%. I won't, can't spoil the ending since I think it is intentionally left a bit open-ended and is therefore left to individual interpretation. 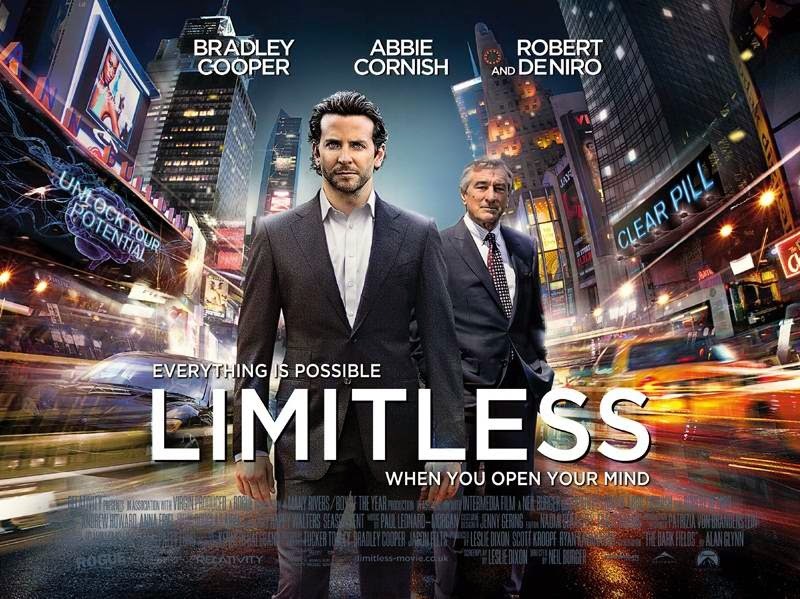 I do though think that Limitless was the better of the two movies. Not only does it have a more realistic set-up, it also only makes a few small assumptions from there, producing a believable story, even in the realm of science fiction. Lucy on the other hand, takes a possible exponential trend, and tries to extend it as far as possible. Limitless takes a more reasonably philosophical approach to the future, while Lucy is more driven by prowess and action. I do think that humans will make breakthroughs in understanding and trying to 'improve' our brains, and that the results will be much more in line with Limitless than with Lucy. Unrelated, the animation in Lucy is pretty unscientific, featuring drugs in the body that are obviously luminescent pinballs in the bloodstream. Also the movie is set in Taiwan, featuring Korean gangsters, who have a giant Chinese dragon head in their hideout. *There's an interesting connection here to Gaia and Bliss from the Foundation series by Isaac Asimov. It's a 7-part book series that's an excellent read, touching both science fiction and philosophy, and I highly recommend it. Fixed the #8! Thanks for the comments, I will check out the Asimov books. I am still in two minds about watching "Lucy". I did enjoy "Limitless" but that was mainly because of the often clever dialogue rather than any realism. Lucy just seems like a mindless action flick, which is fine if all I am looking is for Friday night entertainment (problem is, I am not a big fan of Scarlett Johansson). On a related note, I have no doubt that we will soon have drugs that will have measurable effects at least on well-defined traits like memory and attention. The world will be an interesting place then, especially when people start scrambling over the fence to grab them.